Hopefully many of your questions will be answered here: The Photos on Google+ feature is under constant development, I try to keep up with the changes and edit this post accordingly. These screenshots and advice are from a desktop computer running Chrome and a Nexus 5 running Android. It used to be 250x250 px but the new required size is 960x540 px minimum. A logo style image cannot be used anymore. The cropped area is really small... At least on a square photo. The bigger the original photo, the better. ⦊ Be careful when deleting photos from your phone! ⦊ Having trouble with your profile photo? There is no option to avoid that. To downscale these photos you can use Picasa desktop client https://picasaweb.google.com/lh/myphotos - each album has a size and quantity statistic when you drill down to the album level﻿. For video shares: it depends on the length of the video. Up to 15 minutes videos don't count against the storage. For the standard size photos (max 2048 pix wide) there is no limit or quota in storing them to Google+. You can also share very large images but full size uploads will count against your Google Drive storage quota. (15 GB free between Gmail, Drive and Google+, 100 GB costs 1.99 USD per month). Note: If you share a large photo from Gmail to Drive but don't delete the email, that counts twice towards your storage! 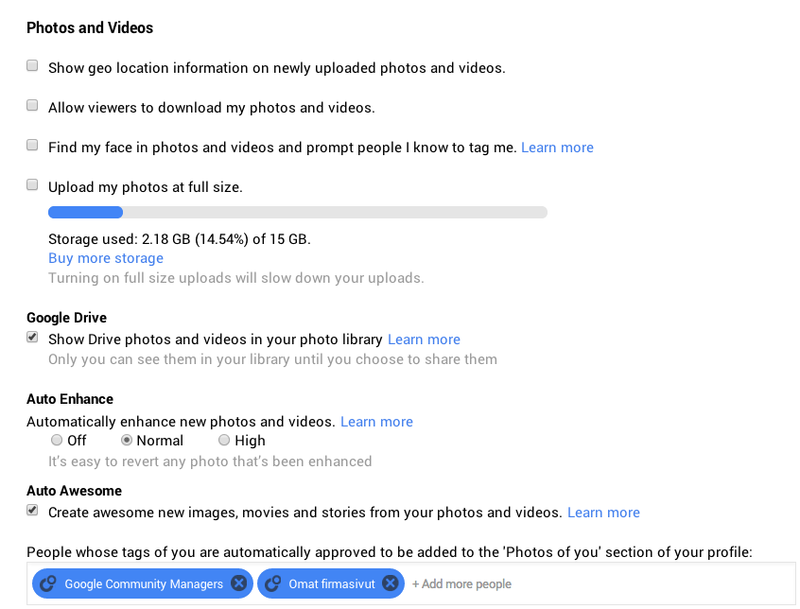 If you share a large image to Google+ from Gmail and you haven't opted in for the "Upload my photos in full size" then that image is made smaller and will not count towards the storage. 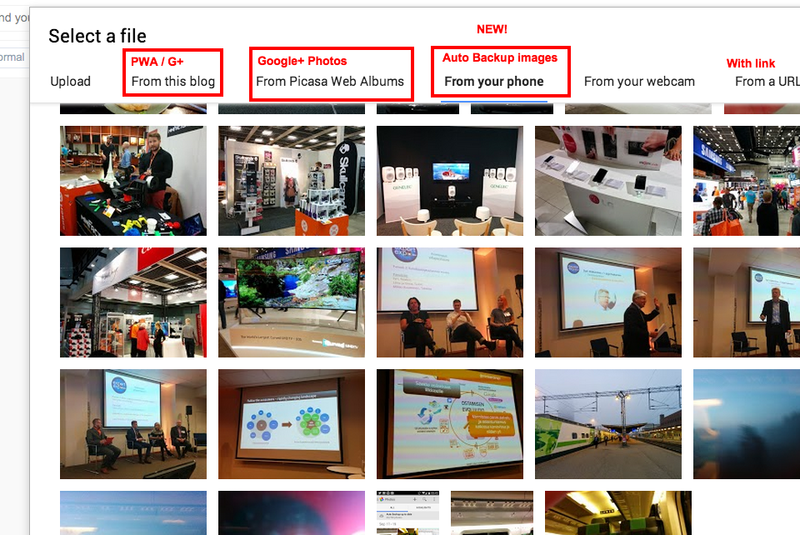 Top Contributors in the Picasa help forum have put together an excellent resource for information about Picasa, Google+ photo autobackup for desktop, Google+ Photos and Picasa Web Albums. If you use #autobackup or Picasa, add this to your bookmarks! The Auto Backup is a Google created folder and moving images from there is not possible, only copying them. Google wants your photos to be safe, that's why the images have an existing copy in that folder. You can delete or download photos here, too. You can also change how and when your photos are uploaded. To my understanding All photos shows all of your photos, also those in the albums. The backed up photos always leave a copy, that's the back-up. If you could move them to albums and then deleted an album by accident, there would be no backed up image left, that's why only copying is possible. Those photos don't take up any storage so it's best just to ignore them. If you delete anything from all photos, you may delete the original, so unless you want to do that, don't. This will show you all the auto backup images. 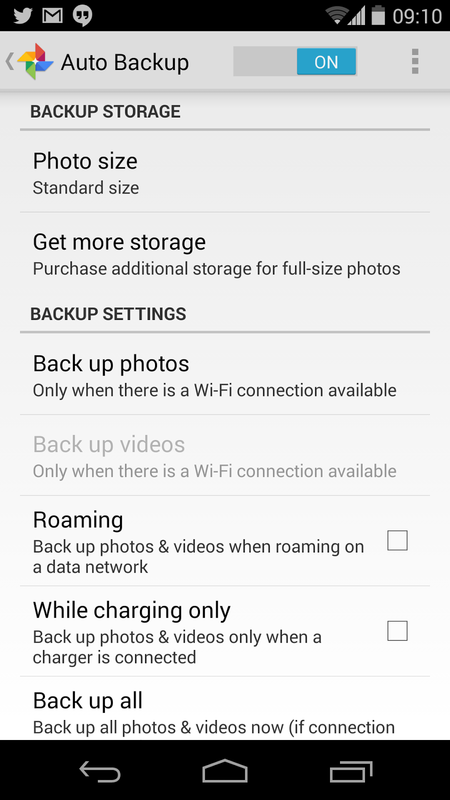 Check your settings for Auto backup! What does the cloud icon mean on my photos? That means it is waiting to upload to Google+ via Auto-Backup - it should have an arrow in it when it is uploading, and no cloud when it has uploaded. How fast the upload works would depend on your connection, I would suggest you use WiFi for Auto backup. Something that seems to have worked for a few people is this. it should work as per normal now. if the Autobackup Cloud icon is highlighted blue tap it to switch it off for a particular folder that you don't want to be backed up. do not dismiss the notification for it. Be careful when deleting photos from your phone! - Delete the Auto backup app. Clear app data. Update. Check sync is on and do full backup. Deleting a photo from the All/Highlights views via the Photo's application on your mobile device will delete it from everywhere - meaning the device and auto-backup cloud. If you only want to delete your device photos then select the On Device menu and then delete. Ensure it uploaded to Google+ first. If you only want to delete from the cloud without affecting your local copies then search for #AutoBackup from your devices Photos application. 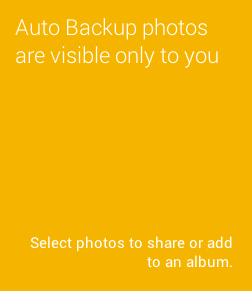 The Auto Backup photos are only visible to you until you decide to share them. Maximum photo size: Each image can be no larger than 100 MB. Maximum video size: Each video uploaded can be no larger than 1 GB in size. Total storage space: Picasa Web provides 1 GB for photos and videos. Files under certain sizes (Google+ normal uploads) don't count towards this limit. Google+, Gmail and Google Drive share 15 GB storage together. The sharing and privacy control is easy: You can disable reshares of your albums, decide who gets to see what and control the visibility of any album. We also support images as small as 400 px wide and scale them up when necessary. Just make sure the ratio is correct. The bigger the photo, the better end result - 1120 pixels or the regular Google+ upload size is really good. On Blogger you can search all your photo albums for images you wish to use on your blog: They will be copied to the Blogger album which has your blog's name. NEVER change any settings on that Google-created album! You'll lose the link between your blog and photos. There are likely other factors that affect whether a large thumbnail or small thumbnail displays, and which image Google+ uses as the thumbnail when you share your blog post link. If you add black & white images or images with transparent background to Blogger, sometimes the colours appear to be wrong after saving. The culprit may be the Google+ Auto Enhance: The photos reside in Google+ created album for Blogger and if you have Auto Enhance turned on, the photos may change in the process, for instance B&W may look brownish and the transparent part greyish. Go to your Photos tab, click on Albums view, find an album with the name of your blog (NEVER delete any images inside or this album! ), go to the image and turn Auto Enhance off. If you store photos & videos in your Google Drive, you can also choose to view each folder as an album in Google+. Only you will be able to see them in your library until you choose to share them. If you have Auto Awesome or Auto Enhance turned on, then those features will be applied to your photos as normal, but your original drive files will remain intact. By the way, using at least 507 pixels wide images you'll get the large thumbnail for your blog article on Google+. Read more about the sharp edges of Blogger from a post by +Adam Auster. Good stuff. - From this blog = photos are hosted in an album on Picasaweb AND Google+ if you have upgraded to it. Deleting this album from Google+ also deletes the photos from your blog! This is a great update: As usual, Google+ users get a few more features. Using the Auto Backup photos from a tablet or a phone makes life a lot easier for a Blogger. You can save a created meme directly to the Blogger album or a designated album for memes. When you check the profile of a person or a Page you can see the "Photos" tab there. The view is different from your own "Photos" in the left side bar (pop-up pillar) view. Google seems to choose the single photos Highlights and does not show all the photos from posts. I posted about this on my +Gplus Expertise page and also on my profile with even more details, hopefully clarifying the whole set up! There has been a slight change, again: When editing a photo from a post one can click the image open directly from the post, again. Thanks for hearing my feedback, Google! 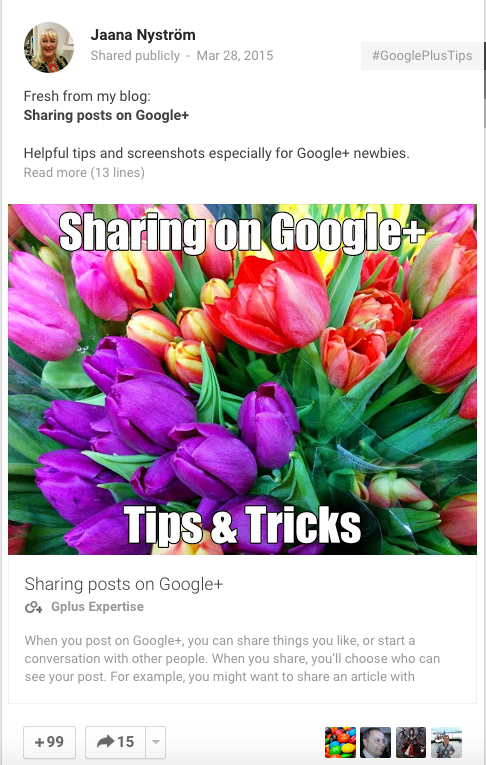 Read more from Google+ Help Center and watch this video from the Developers' +Ali Afshar. 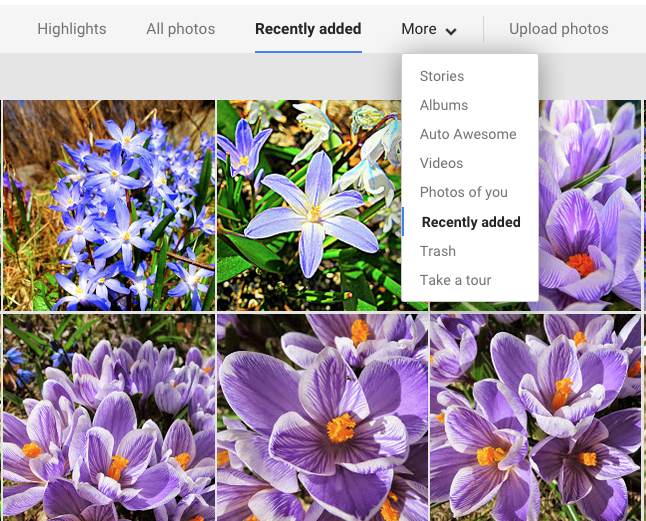 Update in March 2015: Google+ photos added to Google Drive. Help Center article. - More control over your Highlights view. You can choose whether or not individual photos are shown in your Highlights, as well as move highlighted photos to the album of your choice. - Quicker adding to albums. Now you can pick a specific album for your photos right when you’re sharing them on Google+. The lightbox is where photos are displayed when you click on any individual photo thumbnail. From the lightbox view, you can navigate through the album and take a variety of actions on the photo. 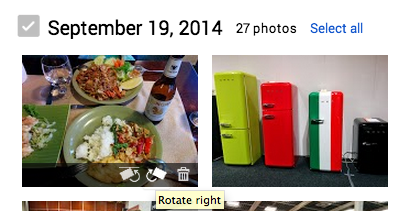 When you click Share in the lightbox view, you create a post for the photo you're looking at. Anyone you share the post with will be able to see and reshare that photo. If you own the album, and you'd like to prevent resharing of your photo, you can disable resharing. People you share the photo with will not be able to see the rest of the album containing that photo, unless the full album has also been shared with them. 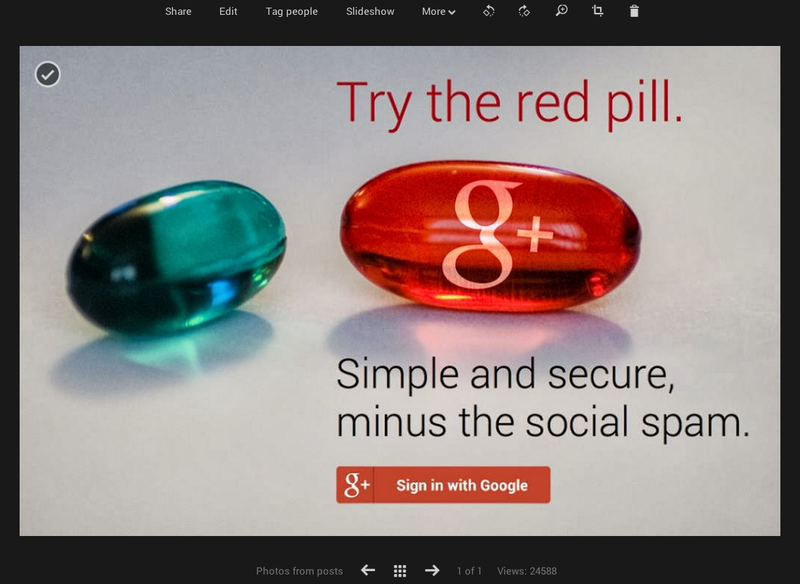 Place your cursor in the top left corner for the Google+ main menu. Scroll down to the Photos section. Uncheck the box next to Allow viewers to download my photos. The photos can still be copied by right-clicking or taking a screenshot, so don't post anything in Public that you absolutely don't want spreading anywhere in the Internet. When you add photos or videos to an event, they are added to a collection shared with all the guests of the event. If you add photos or videos to a public event or event on air, anyone can see these photos and videos. By default, all event guests can contribute to the photo collection of that event. For public events, anyone can contribute photos. Add photos to an event collection any place you see the Add photos button, marked with a camera image: On an event page, from a notification, or on your phone. When you add photos to an existing album that is part of an event collection, those photos will also be added to the event page and shared with the event guests. Adding a few photos before the Event helps attract more attention. Event banner size is 1200 x 300 pixels if you wish to create your own. If the photos are deleted from the phone, what happens then? - The Google+ photos stay unless you delete them too. If you use Picasa, the images will be visible there also. Tagging someone in a photo lets them see the whole album, mind! If you wish to tag someone but not let them see the whole album, just create a new album and copy the photos to be tagged there. Create your own stock photos for social media! A little bit of imagination and there you have it. Visit a market place, a beach, a harbour, a park, a supermarket... Place unlikely objects in strange places and shoot. 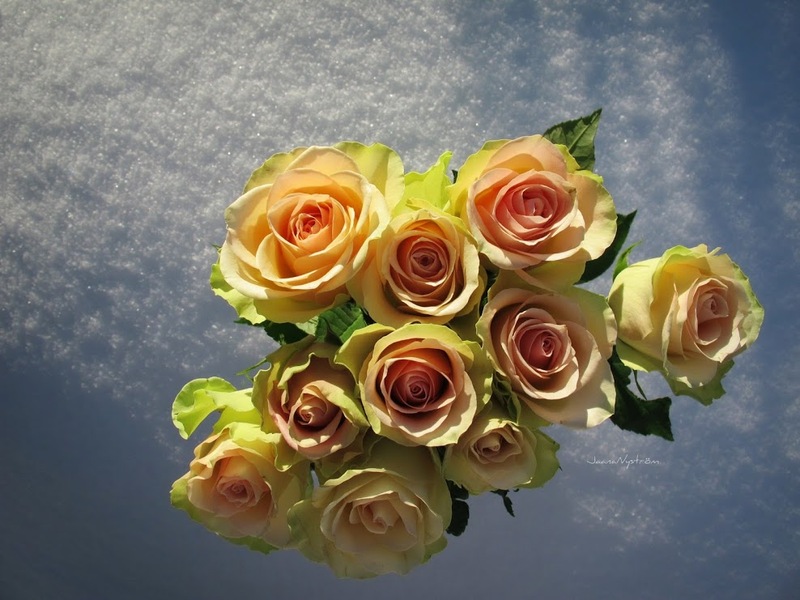 I took around 100 different pics with the help of this bouquet of roses which cost 4 Euros. Snow gives a nice lively background. 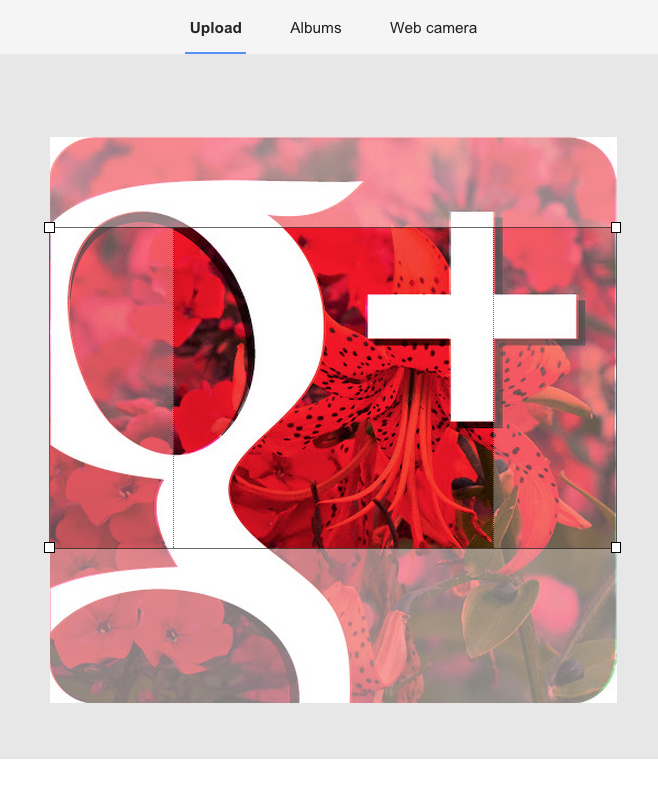 Cropping and editing on Google+ will multiply the amount of usable images two times or more. 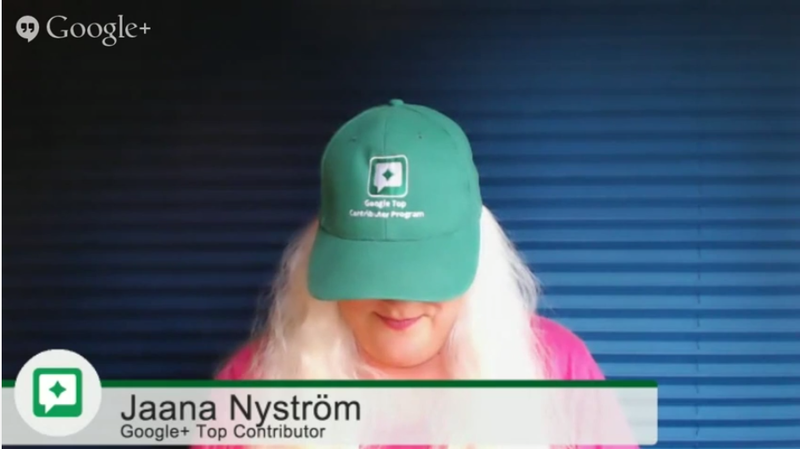 C. Find a photo you have posted, in the Google+ search: Go to the normal G+ search on profile or stream tab. Type the word, sentence or hashtag you have used in the post and click on "Search Google+" or the blue magnifying glass. Then when you get the result, click on "More" and choose "From you". Choose "Most recent" and you should see your own posts. You can see all the different search filters you can use. Clicking on the Auto Backup shows all your backed up photos. Is there something else you'd like to know about Google+ photos?